Rock Hard 4x4 is very proud to offer the easiest and heaviest duty bolt-on light mount for the Jeep Wrangler JK 2/4DR. 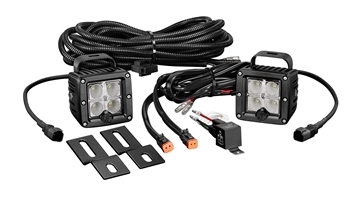 The factory front bumper leaves you no way to mount aftermarket lights including the increasingly popular LED off road light bars. Our bolt-on bar installs in minutes and gives you a safe and secure way to add lights for your nighttime off road excursions. Each Light Mount includes 2 tabs for individual or light bar installation. Constructed from 1-3/4" steel and powder coated black, our Light Mounts are ready to install right out of the box and get you on the trail faster than any other solution available. It's one thing to be Made in USA. It's another to be given the time, quality, and craftsmanship only RH4x4 offers. Each front bumper Light Mount is made from heavy duty 1-3/4" steel tubing to live up to it's lifetime guarantee and give you precise fitment. It's then bent and formed into it's shape, hand welded, and ground down for a look no other manufacturer (overseas or domestic) can offer. Each Light Mount is then powder coated in house, by hand, individually - so every nook and cranny is protected. Built on a jig for precise fitment, our Light Mount requires no drilling and bolts on in minutes with simple hand tools. Don't take that to mean it's flimsy or wobbles, this is a durable, secure, and safe system to mount your expensive lights! Is any welding or drilling required? RH4x4 Light Mounts ship powder coated black with a semi-smooth, semi-gloss finish. Raw, paintable finish available upon request. Where is this Light Mount made?